Tessa Quayle (Rachel Weisz) is found murdered in a remote region of Africa in what appears to have been a crime of passion. Her husband Justin Quayle (Ralph Fiennes) is haunted by the stories of her infidelities and something about her murder just doesn't quite add up for him. Everyone around John tells him to wait and the proper authorities will sort everything out but this is the story of how far one man will push himself to uncover the truth. Brazilian director Fernando Meirelles tells incredibly intimate, personal stories that never feel small. 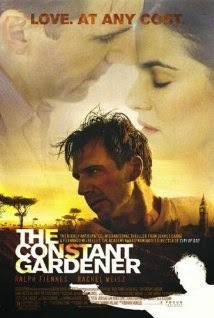 His camera work in The Constant Gardner is brilliant. He uses multiple film stocks and cameras that are constantly moving to tell this story. While the camera work is impressive it never over-shadows the story, in fact the camera is used to underscore the emotional arc of our protagonists journey. I wouldn't say that the camera is a character in the film but rather it allows us a window into Justin's mind and thoughts. Flash backs are also used to great affect in the film, they give us a greater insight to Tessa and Justin's relationship and we understand why Justin is willing to push himself so far for the truth. The film is wonderfully acted, written and directed. While the movie is based on the book by John le Carre it feels nothing like the other spy novels he was famous for. This is not a movie about espionage or political reconnaissance, this is film about love and loss. The stakes are not the future of the free world but something far more personal and in turn something far more interesting, the truth, that's what our protagonist is willing to risk his life for. And our protagonist is not something from an Ian Fleming novel or a Luc Besson movie. No, our hero is a gardener. A well mannered English gentleman who apologizes to the man who tells him of his wife's death because "that must of been hard to say." This is not Liam Neeson in Taken. Sometimes a movie passes you by. You rent it and return it without watching it. You want to see it. You mean to see it, but for some reason the timing is always just off and it never feels like the right movie for that moment. I had been putting off seeing The Constant Gardner for 9 years and it took me being assigned to watch the film to finally sit down and do it. I honestly have no idea why it took so long but I'm glad that I have seen it and I'm glad that I waited 9 years so could watch it through the eyes of a husband. Now its time to knock City of God off that ever growing to-watch list.